OK, I’m moving this amazing recipe to the blog page so it’s searchable and easier to find, because we’ve had SOOOOOOOO MANY people asking for it. Enjoy! Preheat your oven to 375 degrees. Pop the biscuit roll against your counter (I just LOVE doing that). 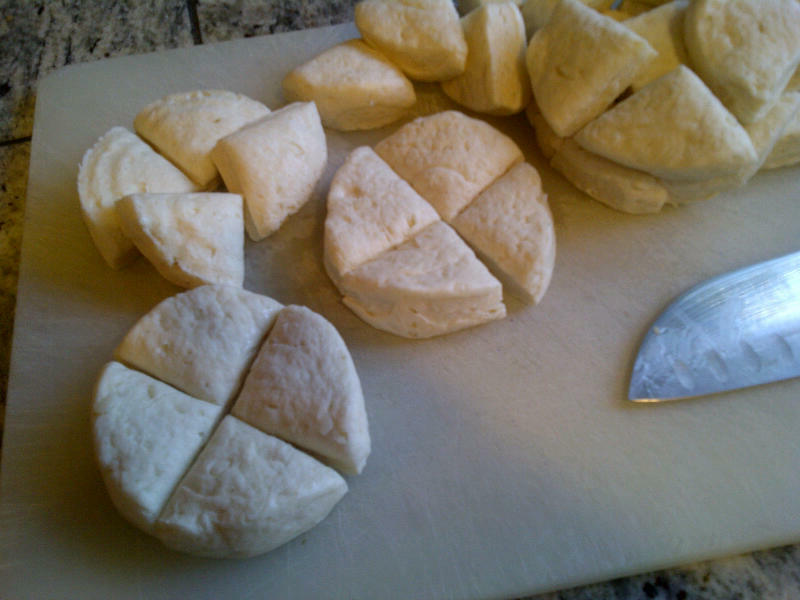 Then cut each biscuit into quarters. Lightly butter a 9 x 13 baking dish. Place the quartered biscuits around the bottom of the 9 x 13 dish nestling them pretty snuggly together (do NOT reassemble the biscuits they should be in a sort of haphazard pattern). Scatter the cheese crumbles across the top. Make sure the bleu cheese crumbles get into any gap between biscuit pieces. 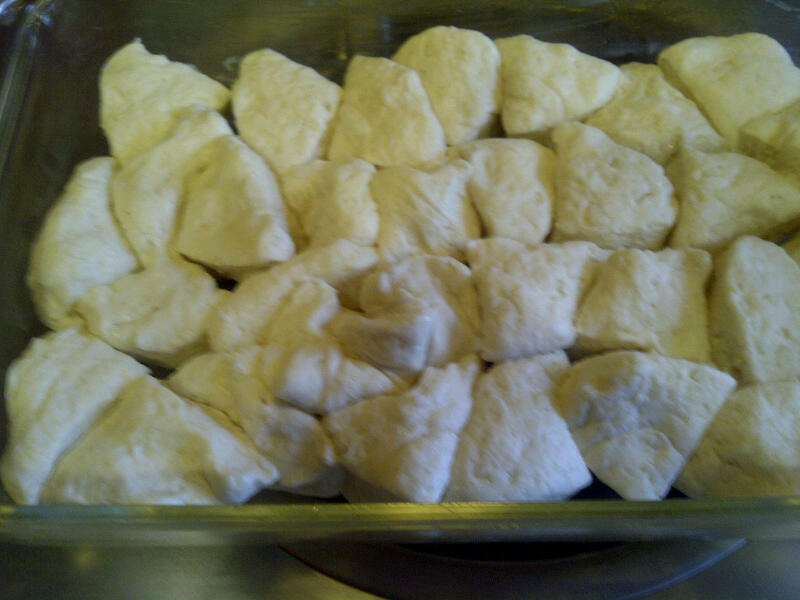 Bake for 20 minutes or until the tops of the biscuits are browned. Take the pan out of the oven, let cool a few minutes then drizzle the top of the whole shebang with honey. This is a great appetizer (my friend Alexandra calls them Bleu Cheese Biscuit Donuts). Or a yummy side dish to a main course salad (like poached pears, bacon and arugula). These Bleu Cheese Biscuits are highly addictive, so it’s a good thing they are easy to make. 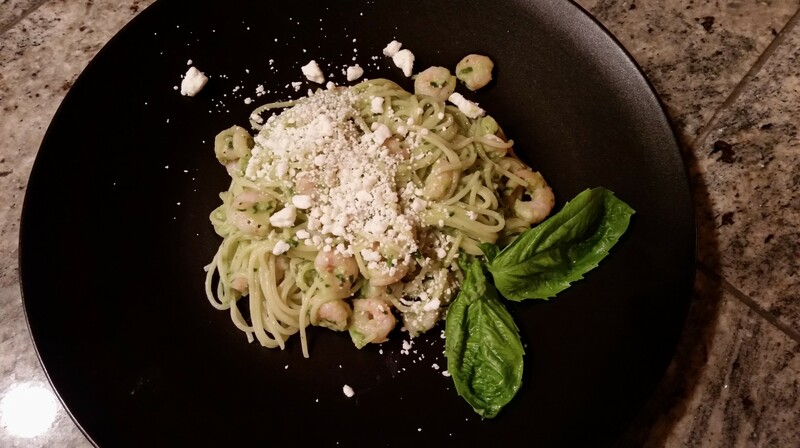 Not only is this a great recipe, it’s an awesome technique! Don’t have Bleu Cheese and honey? No problem. 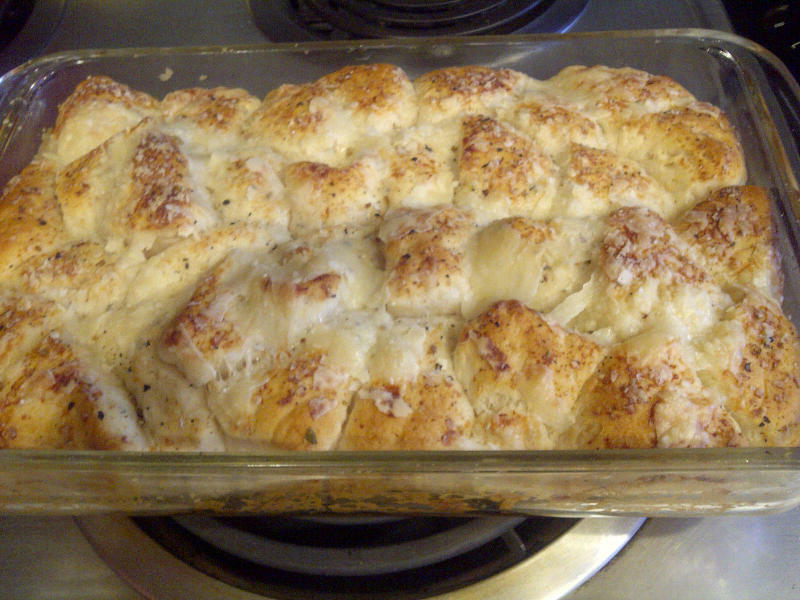 Put the biscuits in the baking dish, then brush the top with your favorite jarred pesto and sprinkle parmesan on top. OR brush the top of the biscuits with a nice, fruity olive oil, then sprinkle Feta cheese and Kalamata olives on top. You are limited ONLY by your imagination (try sprinkling grated cheddar, bacon bits and green onions on top – mmmmmmmmmmmmmm). This is for my sister Kelly who visited and wanted this recipe. Had it again last night and realized I never sent it to you – sorry, Kel! I forgot to take a picture of this before I ate it (it was really good), so I’ll take another one soon and add to post. It’s always easier if you zest the lemon first, then juice. So zest the lemon with your microplane grater (If you don’t have on this is the best food tool ever) and set the zest aside. Juice the lemon and set aside. Take a strainer and line it with a double layer of cheesecloth. OK, now you are ready (time elapsed 4 minutes) Put the milk and the Greek Yogurt in a 4 cup microwave safe measuring cup. Strain the lemon juice into the milk/yogurt mixture (pulp is OK, but you don’t want seeds in there). Give 1 quick stir with a fork to break up the yogurt. Put the measuring cup and milk mixture in the microwave and microwave on high for 4 minutes. Remove the the milk mixture and give it a couple of more stirs with a fork to break up the big clumps of Ricotta. Carefully pour the mixture into the cheesecloth lined strainer and let sit for 5 minutes. After 5, bundle up the ends of the cheesecloth and give the mixture a bit of a squeeze to squeeze out some of the extra moisture. Put the ricotta in a small bowl and mix in the lemon zest and salt with a fork. Add Lemon Pepper if you are using it. Refrigerate ricotta til you are ready to use it. SO, HOW TO USE IT: My favorite 10 minute dinner is to boil up some Orzo pasta, then toss it in a bowl with some olive oil, salad shrimp, lemon pepper, diced green onions and halved cherry tomato. Top the plates with a couple of heaping spoonsful of fresh Ricotta – easy, light and delicious. Or, it’s great on top of a salad, or double the batch and use it to fill pasta shells. . . the list is endless. OPTION 2: If you make the ricotta with the lemon juice then add the zest. Add sugar instead of salt and some diced up raisins. Then use it to fill the center of a poached pear and drizzle the whole thing with honey and top with some roasted slivered almonds. Oh yeah, that’s good too. You are currently browsing the archives for the Appetizers, Sauces and Sides category.